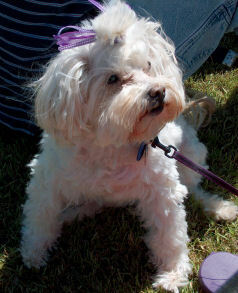 Teddi passed away on February 6, 2006 just 2é¥¡rs after we fell in love with her. Our hearts are broken although we know it was her time to cross the Bridge to wait for us to be reunited with her one day. We believe she was approximately 12 years, 5 months old...although she could have been much older than we first believed. The story of her short life with us will be told on this page, when I have strength once again to review how she came to be in our care. She is missed terribly...even after such a short stay with us; we are heartbroken and lost without her. She came to be loved by us on her first day in her forever home on August 18, 2003.